Keep checking, classes are being updated at this time. Fall class schedules should be set my mid May. Here are our class offerings for the Fall semester – week of September 3rd through week of Oct 31. Classes meet at First Christian Church 910 North Indiana Avenue in Auburn. Each class is 50 minutes long and meets for 9 weeks. All classes (except private voice lessons) are $140. Registration is a once per semester charge of $35 regardless of the number of classes taken. Click on the registration form at the bottom of this page to enroll your student now. Beginning Improv – for students 8-13 years old*. Instructor Alicia Smith. Classes meet 5:40-6:30 Wednesdays. Learning to improvise and express movement and emotion based on spontaneously cued mood, style, tempo, position, level and texture. Instructor will work with each student based on their skill set. Intermediate Improv – for students 14-22 years old*. Instructor Alicia Smith Classes meet 6:40-7:30 Wednesdays. Designed for kids rather new to the stage. Learn stage calls, theater games, beginning script reading, basic character development and stage pictures. For kids with some stage experience. Learn script reading, characterization through dialogue, blocking, scene study and improv. Develop confidence on stage. Excelsior will present 2 one act plays in March 2020. These will be student directed and students interested must take the class. Lessons include how to go from page to stage. Explaining your concept to the production staff. Developing a rehearsal plan and keeping to that plan. Developing a rehearsal calendar. Motivating actors and more. Deciding how you are going to build a three dimensional character. How to make sure you are creating and not reacting. Developing a character and trying new approaches in a non-judgmental setting. Use of body language, props, facial expressions and emotions to enhance the scene. Individual instruction for those students who wish to develop their singing voice and gain confidence performing for others. Must audition and be pre-approved. Individual instruction for those students who wish to develop their singing voice further and gain confidence performing for others. Must audition and be pre-approved. *All ages are approximate. Some older students may be more comfortable in classes that are listed as younger than their age. As well, instructors may choose to place younger students in a more advanced class. 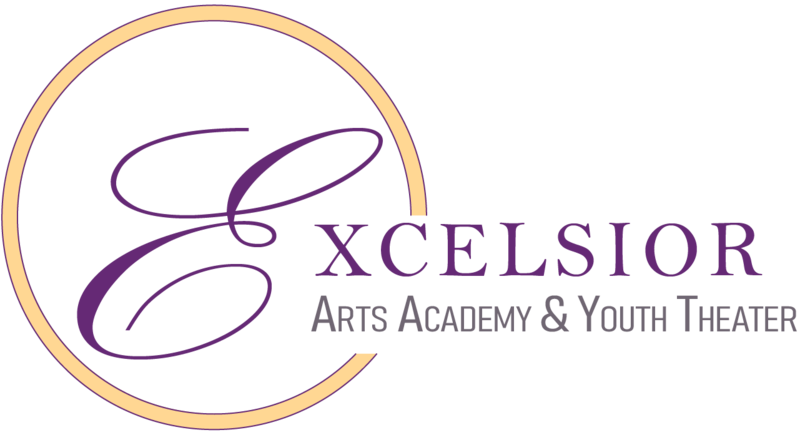 Excelsior Arts Academy can take Visa, Mastercard, Check or PayPal as well as cash. Here are our class offerings for the Spring semester – week of January 6th through week of March 3rd. Classes meet at First Christian Church 910 North Indiana Avenue in Auburn. Each class is 50 minutes long and meets for 9 weeks. All classes (except private voice lessons) are $140. Registration is a once per semester charge of $35 regardless of the number of classes taken. Click on the registration form at the bottom of this page to enroll your student now. How to actively be involved in the theater process. Deciding your characters Super Objective and Objectives. Understanding that your character began before the story and continues after the story and why that’s important. Using theater games and activities to bring your character to life. Deciding how you are going to build a three dimensional character. How to make sure you are creating and not reacting. Understanding that there are dozens of ways to develop a character and trying new approaches in a non-judgmental setting. Use of body language, props, facial expressions and emotions to enhance the scene. Students will get introduced to Musical Theater Composers from the 1940’s through the 1960’s with songs composed by some of America’s best. George and Ira Gershwin, Cole Porter, Rodgers & Hart and Rodgers and Hammerstein, Lerner & Lowe to just name a few. Students will choose songs to learn and perform for others in their studio. Students will get further in depth on America’s early Broadway composers and learn why they are as important today as ever. Explore why they were groundbreaking in their day and how they still influence musical theater. Students will select songs to learn and perform to others in their studio.